How Do I Bill Customers and Get Paid? How Do I Bill Customers to Get Paid? It's great to have sales of products or services in your business, but it's even better to receive the money from those sales. When you start a business, one of your first tasks should be to decide how you will collect money from customers. How you get money from customers depends on your business type. If you get money from customers through credit or debit cards, you don't have to worry about collecting. 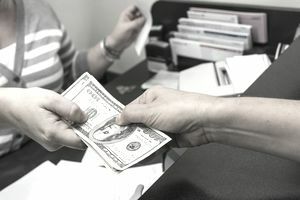 Some businesses accept only cash, but there are problems with a cash business, including not keeping good business records. If you don't get paid at the time of the sale, you must bill customers (including other businesses), which means you will need to find a way to make sure these bills get paid. The most important thing to remember about billing and collecting from customers is that the longer the bill is unpaid, the less likely it is that you will get your money. So you will need to set up a specific collections process and make sure you follow it with every customer. The process will assure that you don't forget to collect the money and that you are handling each collection the same way. Let's take the situation where you are going to be billing customers - individuals or businesses - for your products or services. Here are the first steps to set up a collections management system. Capture information about customer accounts. Learn the laws relating to collections. Decide if you need to check credit. Make a plan for invoicing and reminders. Determine how you will deal with non-payments. Make a plan for turning non-payees over to an outside resource. Then set up a system to capture the information about customers - who owes you money, how much is owed, and how long the amount has been owed. Then you need to enter invoices when you do the work or deliver the product and enter payments as they come in. But you must keep up with this paperwork to keep track of accounts receivable (amounts owed). An accounts receivable aging report is your tool for deciding on a billing strategy for customers. Most accounting software programs have a customer financial account module that allows you to enter this data. Billing and invoicing software is part of your business accounting system, but it's important to find the right software for your specific type of business. Do you send out invoices to customers? Look for software that will let you customize those invoices and send a series of invoices or reminders. This article reviews several different types of invoicing software, all available online. There are several federal laws that protect consumers. The most important is the Fair Debt Collection Practices Act that limits the ways creditors can interact with debtors. You'll need to know this law for your own collections and if you hire a collections agency. If your business has long-term relationships with business customers, it's important to make sure they are the type of customers you want to keep. The best way to evaluate potential customers is to run a credit check on them. You will need the customer's permission so you might want to require a trade credit application for business customers. Then find a business credit reporting agency like Dun & Bradstreet, Experian, or Equifax. Dun and Bradstreet has a guide to making credit applications for customers. Be sure to define the criteria for accepting or rejecting customers, keeping in mind the credit laws. Remember Collections Rule #1 when you consider sending out bills. Many businesses send out bills to customers only once a month, which means they may wait up to six weeks to get paid (a month to send the bill, then several weeks before the customer pays). Send out bills more frequently, or make phone calls in between, to nudge remind customers to pay. Some companies send out bills in batches, with a portion of the customers getting billed every week. This batch billing helps keep cash coming in on a more continuous basis. Let your accounts receivable aging report guide you as you work through your billing and collections process. Your collections system can include phone calls, letters, or both, depending on your type of customer. One common strategy is to start out at a lower level of intensity and concern and gradually become more assertive, then aggressive. This increasing level strategy can work for either phone or letter or email billing reminders. This letter assumes the customer forgot to send payment; it is the "you probably sent this but the payment must be in the mail. Level Two - What is Wrong? This letter assumes the customer wants to pay but unusual circumstances are preventing payment. Letter two suggests payment alternatives but gives a firm date by which payment must be made. This level should be a letter. It assumes the customer is not going to pay and states a firm date by which payment must be made or collections processes will be initiated. Do NOT send this letter unless you intend to actually go to collections on this debt. If a customer just won't pay after you have taken them all the way through this process, you'll have to take the final step. Your options are (a) taking the person to small claims court,(b) turning the bill over to a collections agency, or (c) hiring a collections attorney. Which one you choose depends on the type and amount of the bill, the type of customer, and your relationship with that customer. Read more about your alternatives if a customer just won't pay. After you have put together your plan, have your attorney review everything to be sure you are within the law. Then get busy working your plan.